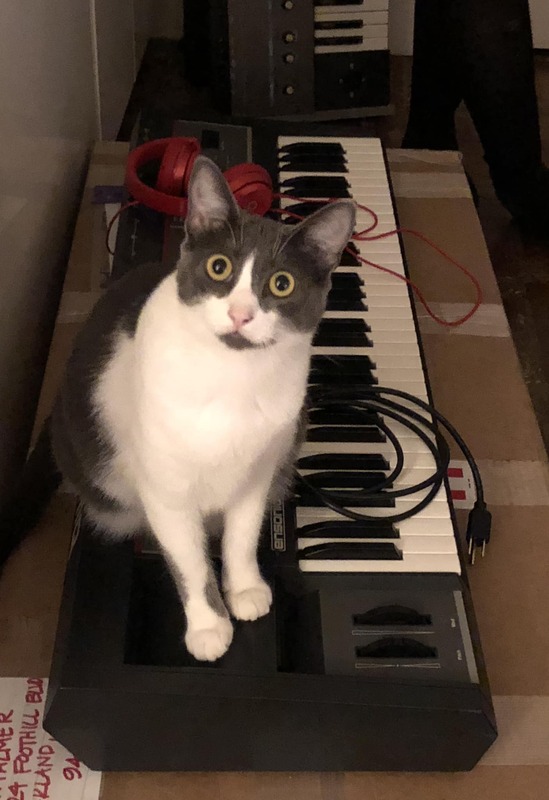 Ripley is quite proud of his synths, an Ensoniq SQ 1 and Akai MPC. From Chris Ratterree via our Facebook page. Finnegan shares his latest composition on a pair of Ensoniq Samplers. Submitted by Greg Cole via our Facebook page. samplers rather than synths but this is Finnegan who spends most days in the studio with me…’helping’. We at CatSynth are quite familiar with Ensoniq’s venerable line of sampling workstations. I got an EPS in 1989, and then upgraded to an ASR-10 a few years later. The latter is still in storage here at CatSynth HQ. Gracie is back! This time with an Ensoniq SQ-80 synthesizer. From Alsún Ní Chasaide (Alison Cassidy) via Facebook. The SQ-80 is basically a reved-up ESQ-1 with a total of 75 waveforms, a 61-note keyboard with velocity & aftertouch, floppy disk drive for storing patches and sequences, and an enhanced sequencer. Great for organs, analog-type sounds, pads and sound effects. Like the classic ESQ-1, the SQ-80 functions in providing analog-type 4-pole lowpass filtering and editing of digital waveforms. Each voice can combine up to 3 of the 75 waveforms. These waveforms include multi-sampled transient attack waves such as violin bow, plectrum picks, mallet, hammer, breath attacks and percussive sounds. There are also 5 sampled drum sets. Three LFOs are onboard for some pretty wild modulation of the sounds you create or edit. From our friend Sawa Masaki (@tjlaser) on Twitter. A cute feline paw on an Ensoniq keyboard. 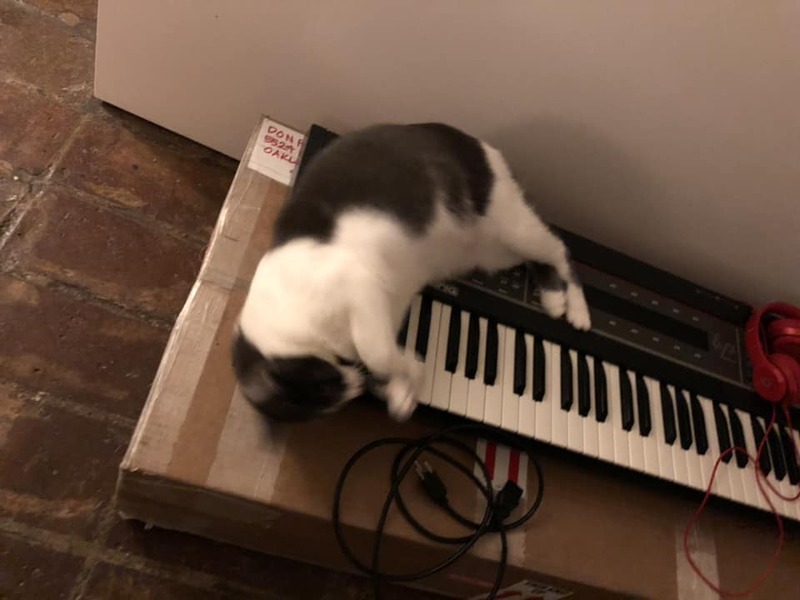 If you are on Twitter, please follow us @catsynth. Submitted by Carl Peczynski via our Facebook page. By Crawling Wind via gearslutz. There are actually some Ensoniq sounds that I miss, though I was able to re-create most of them in E-MU Emulator X. 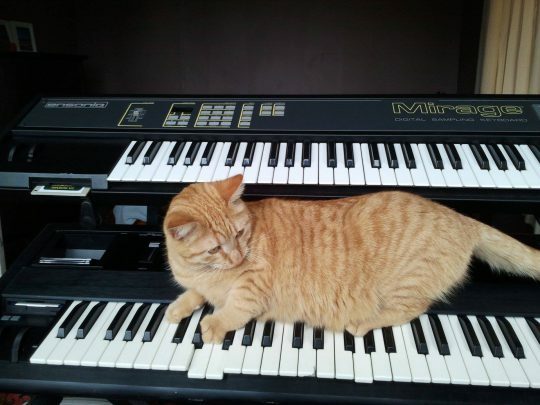 If you have cat-and-gear photos, you can submit them to us via our Facebook page, tweet us @catsynth or contact us. 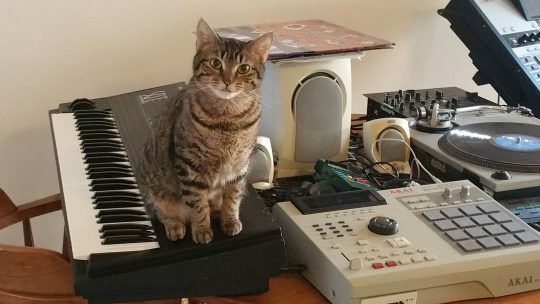 Chewie the cat posing handsomely behind an Ensoniq EPS sampling synthesizer. Submitted by Kiki Cameron via our Facebook page. The Ensoniq EPS and its successor, the ASR-10, were longtime workhorses in my synth collection. Even though the ASR-10 mostly sits in the closet now, I still use some of the sounds from it. You can hear an example here. From tedjames on flickr. I have now added an altbengal tag so you can see his previous images. 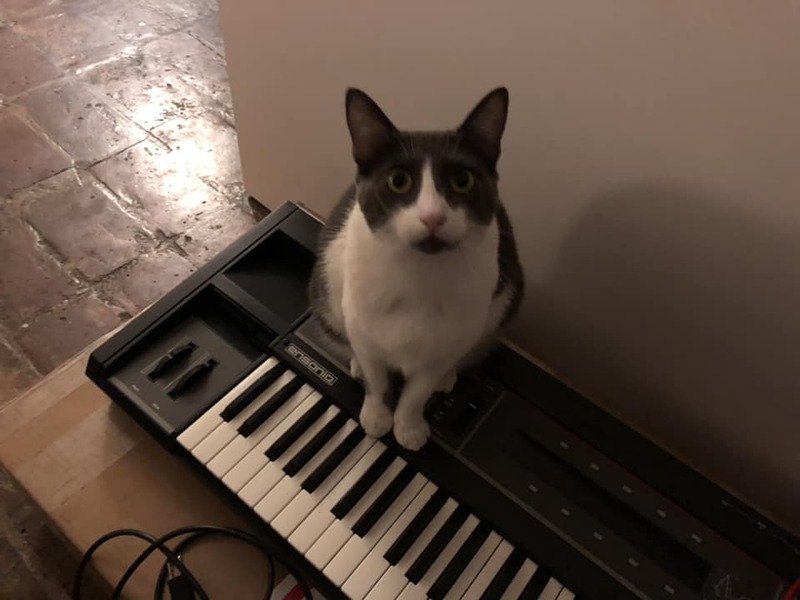 This is a good time to remind readers that you, too, can submit your own cat-and-music pictures or videos via facebook, Twitter @catsynth, or using our submission form. Keyboard Cat’s World Series Wonderful Pistachios Commercial! Also on matrixsynth. The keyboard in this case is the classic Ensoniq Mirage.